Yamaha first launched its CP designation on its electronic stage pianos. By today’s standards, the earlier electric and electric-acoustic CP pianos from Yamaha were too heavy. However, it is this heaviness that made them an industry standard for those who wanted to get real piano sound on the stage, when touring with an acoustic piano was not possible. Now, decades later, the same can be said about the Yamaha CP1 Stage Piano. The CP1 is certainly a flagship model from Yamaha, featuring imitation ivory action and a newly designed wood. The CP1 Stage Piano, unlike its siblings, is entirely dedicated to acoustic and electric pianos, which sound quite spectacular. The three-dimensional sound that is emitted by large concert pianos has been captured by the CP1, which can truly be heard through the megabuck monitor system in a recording studio. The best of both innovation and tradition are incorporated into the design of this world-class 88-key electronic keyboard. Yamaha completely redesigned the sound technology in this CP1 stage piano from the ground up. Yamaha specifically designed every part of the Yamaha CP1 Stage Piano so that its commitment to making a long-lasting and timeless 88-key stage piano keyboard would be reflected. This piano has classic side panels made of wood and the top has a vintage texture, so memories of classic pianos from the past tend to resurface. The cutting edge and state-of-the-art technology that has been incorporated should also become apparent. For instance, the display is in brilliant vacuum fluorescent, the volume knob is made of brushed aluminum, and the Yamaha logo is lighted. Apparently, Yamaha has made sure that the player would find it easy using this piano in performance considering the layout of the intuitive user interface, knobs, and switches. The CP1 stage piano keyboard from Yamaha makes a striking visual statement by bringing together all of these design elements quite impressively. When looking at the CP1, it can be seen that Yamaha paid a lot of attention on detail and quality in all the components. Controls: When playing this Yamaha CP1 Stage Piano, everything is right there in front of the piano player. Banks and patches can be changed at a snap, while it is painlessly easy to save presets. It has quite a bright screen, and parameters on the CP1, such as hammer hardness, will prove to be very useful. Feel: The CP1 has a very natural weighting, which means that it is not too heavy, perhaps like alight to medium grand piano. In other words, it offers the most realistic feel in comparison to many other digital pianos. The CP1 also has a Spectral Component Modeling system for generating tones, so the sound of both acoustic and vintage electronic pianos is recreated quite marvelously. This technology responds to the touch of the player, so more creative expression becomes possible than was ever before. A special NW-STAGE action was also developed by Yamaha for this piano, which means that the CP1 will easily meet the demands of professional piano players as well. 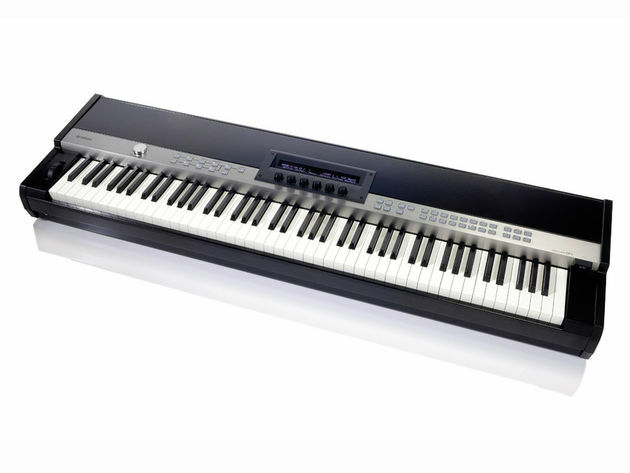 The bottom line is that the Yamaha CP1 Stage Piano is an incredibly expression piano with perfect combination of tone and touch, and outstanding quality, making it ideal for onstage performances.